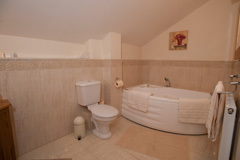 B&B room on a farm with Jacuzzi bathroom. 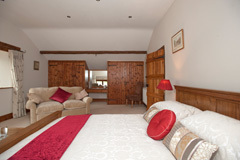 Ideal weekend break for couples or the family. The Orchard bedroom is a large attractive room with views overlooking the orchard one one side and fields on the other side where many a deer and fox have been spotted. 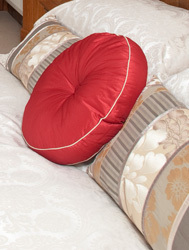 The bedroom comprises a comfortable king–sized bed with luxury bed linen. There is a comfortable settee on which to relax and enjoy the flat screen television with Freeview. Ample storage space is available in the elegant oak bedroom furniture and a silent refrigerator is on hand to cool your drinks and nibbles. The beautiful en–suite bathroom has a Jacuzzi bath and separate walk–in shower with mood lighting for you to enjoy a soak. 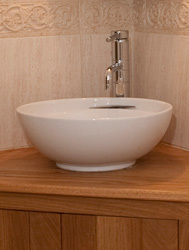 Luxury toiletries and large fluffy towels are provided. Tea and coffee making facilities are provided in your bedroom and a hairdryer is included. Complimentary Wi–Fi internet access is available in the bedroom and in the neighbouring seating area.